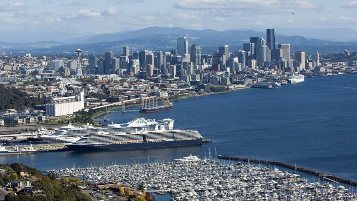 Situated on Puget Sound, surrounded by the Olympic and Cascade mountain ranges, the Seattle city skyline is truly impressive with soaring glass high-rises and 100-year-old buildings standing side by side. This beautiful port city came into its own after gold was discovered in the Klondike and 100,000 people passed through the Northwest in 1897 and 1898 on their quest for wealth in Alaska. Pioneer Square - At the Klondike Gold Rush Museum find gold-dust history as well as a vibrant jazz nightlife in turn-of-the-century Pioneer Square where the city first took root.